Lighthouses have been used to help guide sailors for thousands of years. The ancient Egyptians were the first to actually build lighthouses; prior to this, fires were lit along hilltops as a warning to mariners. One of the classical Seven Wonders of the World was the 400 foot tall Pharos lighthouse of Alexandria which was destroyed by an earthquake in the 3rd century B.C. Here in America, the Mayans used lighthouses such as Tulum in Mexico to guide sailors through the Caribbean, while the first North American lighthouse was Boston Light, built in 1715. 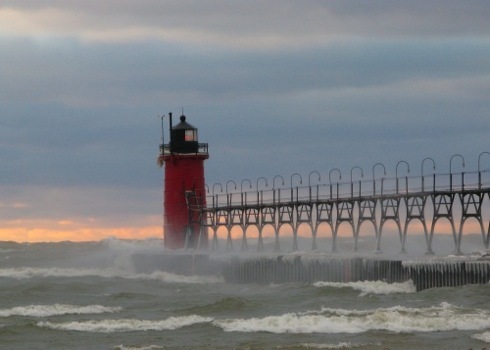 In Michigan, over 115 lighthouses have served as beacons for the sailors of the Great Lakes. Each issue of Lake Effect Living will focus on one of these impressive structures. This autumn, Michigan author and lighthouse historian Meg Mims focuses on South Haven's most celebrated lighthouse keeper, Civil War veteran James Donahue. Imagine a 30-foot tall wood structure on the South Haven pier, supported by pillars and open to the crashing waves of Lake Michigan. Imagine this lighthouse, along with its connecting 75-foot long wooden walkway that stretched shore-ward to the keeper’s dwelling on the bluff, coated in ice ribbons. Imagine a man on crutches crossing that walkway every day for 36 years, regardless of heat, rain, snow or ice. A picture of true dedication, indeed. The keeper’s logbook entry, dated July 3, 1875, is haunting: “Rain and cloudy, wind moderate, lake smooth, the night dark, the weather warm – my wife died this afternoon at 4 pm, of lung disease.” The next day’s entry read: “Foggy, wind, the fog thick all day, the lake smooth, the night dark – I berryed my wife to day at 4 pm.” Since Donahue had a young son by his first wife, he married again within the year. James and Ann Kyme Donahue welcomed five more sons and a daughter by 1893. A family photograph showed the keeper in his uniform surrounded by his sober wife and children. Another photo shows his extended family and a dog on the lawn beside the trim, neat keeper’s residence. In heavy weather, the keeper or his family had to stay the night in the tower and keep watch for any ships needing help. From the log book dated May 5, 1881: “I went to the village councal one hour in the evening. My wife and brother was at the end of the pier blowing the foghorn and braut in the Steam Tug Mirands at eight thurty PM.” At the time, the foghorn operated by hand using a bellows. Given a long fog-bound night, confined to a small space, perhaps chilly even in midsummer or half-frozen in winter, two people taking turns kept vigil despite the waves and weather to prevent tragedy. The entire family helped with daily chores. Donahue also ran a boat rental to supplement his income. Taking in a boarder or two also helped many families make ends meet. More remote lighthouse stations rarely had visitors or opportunities for interaction, either for extra income or social contact. Donahue was no doubt thankful to be stationed in South Haven which was close to a thriving port. A lively man who was popular with local residents, Donahue even sold real estate in the area. Photographs from the era show him with his trust-worthy crutches. Kerosene was the usual type of fuel used in lighthouse lanterns. 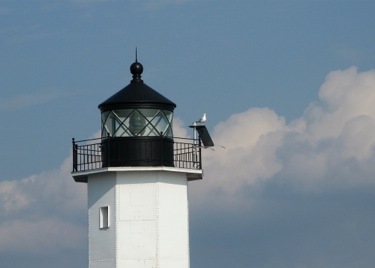 In 1890, however, South Haven was fitted with a Walsbach burner light which used gasoline. Around this time, gas stoves for cooking and heating became popular. The Walsbach burner doubled the light’s intensity and cut fuel requirements in half. More improvements occurred in 1900 when South Haven’s pier was extended another 400 feet from the shore. The tower was moved to the end of the pier in 1901, and a new section built to join with the old catwalk. The following year, the Light House Board ordered a Fifth Order Fresnel lens installed into the deteriorating wooden tower and hired 11th District Engineer James G. Warren to replace it with a metal structure. Donahue retired in 1910 after saving 17 lives. He often jumped into the water to save them, including two of his own sons, and earned a silver medal in recognition of his heroic acts. Local residents of South Haven may have considered silver second-rate, since they fashioned their own medal of gold and awarded it to him. James Donahue died in 1917, was buried with honors at the Lakeview Cemetery and unknowingly served as a model for the fictional one-legged lighthouse keeper Trevor Tavish in “Ghostly Lights” written by Annick Hivert-Carthew. The keeper’s dwelling is currently one of the Michigan Maritime Museum's complex of buildings. South Haven’s South Pier light still stands and is open to the public during the annual June Harborfest, free of charge.